Black Beauty and hair magazine featured our 3 x Braids stylist of the year. 2011,2012,2013. We are now in the Hall of fame for winning this prestigeous awards 3 times. #hectorsglobalhairwithzeal #awards. 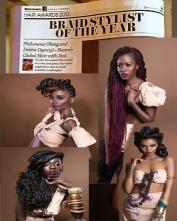 Philomena Obeng and Debbie Oyeniyiof Hectors global hair with zeal said "To win this award 3 times in a row feels great. Our main inspiration was to create wearable styles."